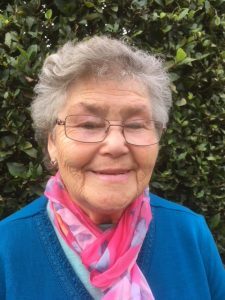 Gwen came to the UK from St Helena in 1955 at 20 years old to work at Kimberley Hall, Norfolk. She now lives in Norwich. In St Helena, they had a Government scheme where they recruited young women to come over for domestic work. My sister wanted to come and although I was a teacher at that time, my mother and I decided that Heather was too young to come on her own and I gave up the teaching job to come with her. I’d been a teacher since I was 15. The Governor of the island interviewed us to see if we would really like to come and if we understood what was involved in it, and we said we would. They just booked us our passage and we arrived in Wymondham. We knew we were coming to Kimberley Hall and were told we would be chambermaids to start with. We had to travel on a large liner, which took two weeks, and then from Southampton by train. We changed trains several times, which was quite a frightening experience because we were not used to travel. I was met by a pen-friend from Kent, and she put us on the right train to Norwich, and then we had to go from there to Wymondham. We got to Wymondham and it was very late and we hadn’t a clue where to go, so we asked the porter how to get to Kimberley Hall. He phoned Lord Kimberley and they said as it was very late at night could we stay in a hotel somewhere and then come in the morning. Obviously we had no idea about hotels, so we said, ‘no, we’d rather come now’. So he said, ‘Right, take a taxi’. Lady Kimberley opened the door and there was a huge doormat with a lion’s head on it, which was quite scary! She took our cases and made us a nice hot drink, showed us the bedroom we shared. It overlooked the lake. There was a beautiful view. One thing we didn’t understand, because we never had one in St Helena, was they had an electric fire on when we arrived, because it was November and very cold. We didn’t know what to do about it, so we didn’t turn it off. A couple of days after, Lady Kimberley came into our room and said ‘Are you settling in? Oh, you didn’t turn the fire off!’ So she showed us the electricals and how to turn it off. She showed us our jobs. We had to get up early in the morning and take them their breakfast. We had the chef doing it but me and Heather had to take turns in taking the breakfast on a tray to Lord and Lady Kimberley. When they had visitors, though, they would come down in the dining room and it would be all laid ready for them. Chambermaids had to do everything to do with the bedroom. You’d make the beds, hang up their dressing gowns, go round and dust and polish. Run the bath for them in the morning and then clean the bathrooms after. That was basically what we were required to do. And if they were in bed and hadn’t got guests we would take their breakfast on the tray to them in their bed. When I became a parlourmaid, that involved again cleaning, polishing, hoovering – although we did have other ladies who did the big cleaning. And general things like laying the tables, setting out the breakfast and clearing up behind them. We did have to wait at table. Sometimes we had about thirty or forty people. There was a massive dining table. I can remember when we had a shooting party there and Lady Kimberley would serve the meat, for instance, cut it up and put it on a plate and we would put it around to each guest. We had to learn what side of the person to go to, lay the table with glasses and drinks, and then we would take the dishes round with the vegetables and they would help themselves. I can remember one funny occasion. We had a guest who was quite a famous man. He was nearly blind and when my sister held out the dish for him to pick up his potatoes he dropped them on his lap and she burst out laughing ‑ she was quite giggly, my sister was. But he laughed with us. They saw the funny side of things, they were quite relaxed. It was hard work when they had shooting parties. In the evening the ladies would leave the dining room and go into another room and the men would sit up at the table drinking. We were too shy to go in to clear the last dishes from the table and consequently sometimes we didn’t get to bed till after midnight, because they were still sitting in there. 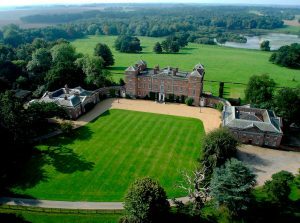 Kimberley Hall was not far from London and Newmarket. There were some interesting guests. We had film stars. I remember Kenneth Moore, and another lady, I can’t remember her name. We’d have jockeys – Lester Piggott. They used to have a lot of guests when they used to have shooting seasons there. The Kimberley’s had racehorses. And animals ‑ horses and cows. They had a farm nearby as well. The first winter we were here was tremendous. We’d never seen snow before and they had a lot of lightning and it literally struck a horse in the field, right in half. That’s how severe it was then. The first Christmas there the family went away and we said we would be happy to stay. But they didn’t want us to be on our own and I wrote to my pen-friend in Kent and asked could we come to stay. Her family were delighted to have us. And do you know, they even sent us down by chauffeur – a chauffeur-driven car all the way to Kent! We stayed there with my friend and her mum and dad and her brother for three days and then our driver came and picked us up again. We were at Kimberley Hall for a two-year contract first and they paid our fare back home. Then they asked would we come back again and we said yes. By then we had met our prospective husbands and they were upset thinking that we weren’t going to come back. My future husband was a gardener at Kimberley Hall and he would very often have to come in the kitchen bringing vegetables and things like that. I can remember one occasion – of course they used to have pheasants – I had to pluck a pheasant and the smell was terrible. And Brian came along and said, ‘I’ll do that for you’ and he plucked it. So that’s how I met my husband. My sister’s husband didn’t work at Kimberley Hall; he was an electrician, but we met him when we used to go to the cinema. He was a friend of my husband, so that’s how they met. We came back early 1957, but we were only at Kimberley Hall for a few months. Unfortunately Lord and Lady Kimberley’s marriage broke up – they separated and decided they would have to shut it up because they were going their separate ways. The house was closed temporarily, and then I think it was taken over by someone else. We had got married by then and my husband got a job as a gardener at Hingham with Captain Denny. He’d lost his wife but he had a daughter there, and I was a cook. He knew me from Kimberley Hall. I’d had some cooking experience at Kimberley Hall because the chef had left when I went back and Lady Kimberley asked me to do the cooking. I was a bit nervous, although I could cook in St Helena. She showed me one or two methods and from then on I used to do it. The cooking wasn’t very different from what I was used to, just the ovens that we used were different. But I got used to that. I had watched the chef before. I used to cook for parties for Lady Kimberley, until they actually broke up and he left and then I cooked just for her, very simple meals really. She stayed there for quite a few months on her own and that was quite sad really. For parties, I cooked roast pheasants, joints of beef, chickens, casseroles, things like that. They were large quantities. We called Lord and Lady Kimberley ‘My Lady’, or ‘My Lord’ and the children were called either ‘Miss’ or ‘Mr’ – the girls ‘Miss Caroline’… one was called Nicholas ‘Mr Nicholas’. On one occasion Lady Kimberley had a dinner party and her son was coming back from the forces very late at night. They had all gone to bed and she asked us, when they come in would we serve some caviar for Mr Nicholas. We put it aside in a little container but when we were washing up the dishes, I accidentally scraped the caviar into the food bin. When we knew he’d arrived, my sister said, ‘Where’s the caviar?’ I thought it was tealeaves and I’d scraped it into the bin. But fortunately it had landed on a raw cabbage leaf! So I fished it out of the bin and put it on his plate with toast and he didn’t know any different really, because he was drunk! And no-one knew anything about it until now and I’ve said it! We really enjoyed working at Kimberley Hall. We were so upset when their marriage broke up and they were leaving. They were really a very nice couple. St Helena is, obviously, a very isolated island. We had to wait for the big liners to come in – to bring passengers in and food and clothing, although most of the food was grown on the island. My dad was a farmer. Life was at a much slower pace, you didn’t rush around like you do here. We didn’t have many cars there, so practically you walked everywhere. We used donkeys to go from the country where we lived down to Jamestown where the main shops were to take my father’s vegetables to sell to different people or to shops. Then we would buy our groceries and take them back on the donkey. Jamestown was down in a valley so you had to walk back up steep little narrow roads with big high rocks and hills above you, so if we did have a very bad storm it would have been very dangerous. It had happened once that rocks rolled down into the valley in Jamestown and went through some people’s roof. I don’t think there were any casualties, though. That was a different culture, really, the pace was slower. I wouldn’t say the food was different but we had more fresh vegetables and fruit because my dad was a farmer. We had our own cows and goats, so we had our own milk. There were seven of us in the family. Those who stayed on the island – one of my sisters was a school teacher and then she became a nurse. The boys had their own little businesses or travelled up and down to deliver their merchandise to different places. I’m ten years older than my sister Shirley and later on she came over to Highclere Castle to work and then a few years after that my brother came over to work in the same place. They did similar work to Heather and me. Worked in the kitchens – parlourmaid, housemaid; and my brother was a butler. He didn’t like it! My sister married and she stayed there for a while and then moved to Wales and Basil moved down to Wymondham to stay with Heather and after a number of years he met his wife here. We meet up quite regularly. I meet up with my sister in the town or I go and visit them in their home. I haven’t been back to St Helena for about 20 years. It’s too expensive now. I went back after the first two years at Kimberley Hall and then I think it was about five years after that I went back, and then the last time it was about 20 years ago. Gwen Browne talking to WISEArchive on 6th December 2017 in Norwich. Gwen’s sister Heather Massey’s story From St Helena to Kimberley Hall is also on the website.